How cute! I actually saved the how-tos for this kind of project about fifteen years ago to do with my kids. As with many other good intentions, this one never came to be. Now, though, I can just do it by myself - thanks! I do find it encouraging when "freak out" is part of the project directions. So comforting, then, when the freakage does begin, to know even the expert who wrote the directions was a little bit daunted. Great idea! I will be awesome at the freak out part of step 6! Really wonderful idea! I'll try it with children I work with. Super idea, I need a bowl for my keys! This reminds me of making pinatas in Girl Scouts! What fun. I like the idea of using a musical score, I think it created a really cool pattern! Fun, easy to read directions too. Thanks! Great how-to....I do a lot of crafting with the grandkids...so freak out is a normal part of any craft for me! !...so glad it is for you too. 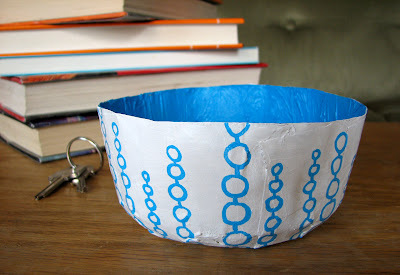 Wonderful how to..Just right for the warmer days to do crafts with kids.Love this idea have to make few for my self. Thank you so much for sharing re linking your blog. Love that idea. I'm a huge fan of Mod Podge. And an even bigger fan of freaking out. You have really gotten a lot of use out of that dumpster hymnal. I am so impressed at your creativity plus greenness. Looks like the perfect bowl for the mini yarn balls my daughter is endlessly winding! This would be a great project to do with her! Thanks! I love this, what a great project! I'll be linking to this, thanks so much for sharing! You've been dumpster diving, that's funny. Hey...not to downgrade your project, because it turned out super cool, but my daughter just did this in kindergarten for Easter and they used the coolest thing. There is a special kind of tissue paper called "bleeding" and it lets the colors bleed together. So when they're layered and mod podged together, it looks like water color. I love yours, just wanted to mention the other cool one I've seen lately. 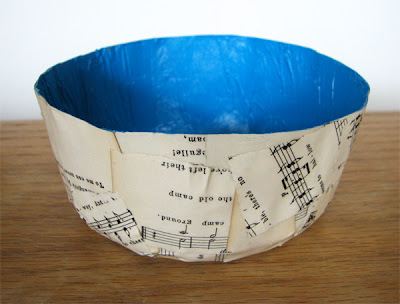 love the bright blue inside-only color! freaking out seems to be a hit! it did make me feel really motivated to start the project and *get* to freak out too! Oh totally. Freaking out is awesome. VQ, sounds interesting. I'll have to keep an eye out for that paper. Awesome idea! I'm linking to it! I love this! I am an art teacher and I am going to have my students make these! When I have made these, I have used a hairdryer after each layer. No waiting 2-3 days! the chair, the bowl! awesome! I work at a music store and we recently got rid of some old/yellowing sheet music. I took a few books home to collage with, but I think I'll try this as well! i posted about your tutorial on my blog she's crafty....thanks for the great ideas!